Monday: Good Grub (S), Page 64 of the book, Trim Healthy Table This is Pearl Barrett and Serene Allison’s newest book and it is filled with yummy delicious wholesome recipes to try. We had a request this week for steak from our middle daughter. This delightful, easy and quick meal will be the perfect fit. 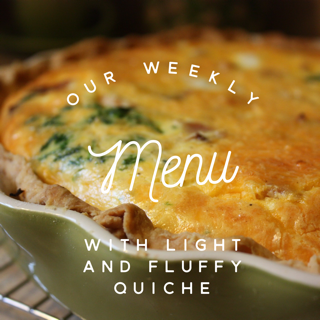 Tuesday: Quiche (S) Our kids love their tea parties and who doesn’t like a tea celebration at dinner! Wednesday: Spaghetti (E) Made with Dreamfield Pasta and sugar-free sauce. For the weeks the kids have been asking for a noodle dish, spaghetti with low carb pasta is the perfect match. Thursday: World’s Laziest Lasagna Skillet (S), Page 69 of the book, Trim Healthy Table. I’m pretty sure it was the name of the recipe which made me add it to this week’s menu. Easy, quick and delicious -yes, please! Saturday:Blackened Fish Tacos (E), page 60 of the book, Trim Healthy Table. Crispy fish packed with a yummy beans and low carb tortillas. Sunday: Chicken Nuggets (S)- One of our favorite family recipes, our chicken is baked not fried but just as popular. Lemon Cream Pie (S) page 408 in Trim Healthy Table. Layer the Pie Crust or Baking Dish with Cheese, Kale, Sausage, Cooked Bacon and onion. In medium bowl, combine eggs, milk or cream, and then add salt, pepper and Italian Spice blend . Beat until smooth and pour over cheese and meat. Place prepared pie in preheat oven (375 degrees F) If using a crust you may choose to cover with foil to protect it. Bake in the preheated oven for 45 minutes, or until filling is set and crust is golden brown. Remove the foil, if used and continue to bake for 15 mins if the quiche is not set.